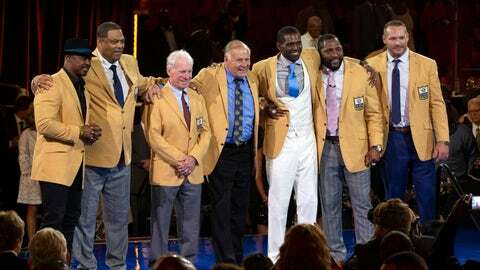 Seven members of the Pro Football Hall of Fame’s class of 2018 will be on hand Saturday night in Canton, Ohio, for the induction festivities, along with more than 20,000 fans. About 600 miles away in Chattanooga, Tennessee, the eighth new Hall of Famer, Terrell Owens, will be doing his own thing. Again. Ray Lewis, Randy Moss, Brian Dawkins, Brian Urlacher, Jerry Kramer, Robert Brazile and Bobby Beathard will be at Tom Benson Stadium for the festivities. Expect some rousing speeches, plenty of hugging and lots of tears — Dawkins, for one, has guaranteed the crying. He and Brazile had wet eyes Friday night when they got their gold jackets at a dinner. Owens has made the unprecedented move of deciding not to attend the inductions at the Canton shrine. He’ll have an event at the college he attended.